Henry Pelham’s tenure as First Lord of the Treasury continued the direction and style of politics inaugurated by his mentor, Robert Walpole. Pelham was the second surviving son of Thomas Pelham, first Baron Pelham of Laughton, and his second wife Lady Grace Holles. Born in London on 26 September 1694, Pelham was educated at Westminster School and Hart Hall (now Hertford College), Oxford. His father’s death in 1712 brought him cash and land in the family’s home county of Sussex. The Pelham family had traditionally been Whigs and both Henry and his elder brother, Thomas Pelham-Holles, Duke of Newcastle, maintained this allegiance. Pelham volunteered for the army during the pro-Stuart Jacobite rising of 1715, commanding dragoons at the Battle of Preston. He spent time travelling in Europe before becoming MP for Seaford in Sussex, thanks to his brother’s patronage. He held this seat until 1722 when he was elected as one of the County members for Sussex, holding this seat until his death. His brother’s patronage also helped him acquire his first major office in 1720, as Treasurer of the Chamber (Newcastle was Lord Chamberlain) but, following Walpole’s appointment as First Lord, Pelham took a seat on the Treasury Board. Pelham and his brother were key allies of Walpole in his struggle for control of the administration with John, Lord Carteret and both were rewarded, following Carteret’s sidelining in 1724. Pelham served as Secretary at War from 1724 and became a Privy Councillor in 1725. Pelham married Lady Katharine Manners, daughter of the second Duke of Rutland, in 1726. The couple’s two sons and two of their six daughters died in infancy. Despite these familial misfortunes, Pelham’s political career proceeded apace. He became Paymaster of the Forces in 1730 (although, unlike other holders of this office, he did not use it to enrich himself) and served as one of Walpole’s senior lieutenants in the House of Commons. Following Walpole’s fall in 1742, Pelham became leader of the Walpolean faction, known as the Old Corps Whigs, in the Commons. Pelham’s political skills in managing the Commons meant that he was quickly earmarked to take over from Spencer Compton as First Lord. Compton’s death simply accelerated the process and Pelham succeeded him in July 1743. He subsequently became Chancellor of the Exchequer (as Walpole had also been) as well. Following Walpole’s fall, Carteret once more emerged as an important political figure, mainly because the King valued his diplomatic skills in a period of international tension. The Old Corps Whigs were, however, slowly able to gain the upper hand over their old rival by resigning in February 1746. When George II was unable to form an alternative administration without them, the Old Corps were returned to power and Carteret’s influence diminished. Pelham, along with Newcastle and Philip Yorke, Earl of Hardwicke and Lord Chancellor, were the mainstays of the government. Pelham worked hard to manage the Commons and domestic affairs more generally, while Newcastle concentrated on foreign policy and Hardwicke tried to keep the peace between the frequently quarrelsome brothers. As head of the Treasury, Pelham’s instincts were always towards reducing expenditure and he was sceptical about some of his brother’s more expansive European alliance schemes. Mindful of the impact on national finances, he succeeded in passing a scheme to consolidate the national debt and reduce the interest rate in 1749. He died in March 1754, shortly before the General Election. His integrity and unwillingness to enrich himself in public office were noted by contemporaries. A further testament to his political skills came from George II who remarked, on hearing news of his death, ‘I shall have no more peace’, a comment which proved remarkably prescient. The Consolidation Act 1749: reorganised the Royal Navy. The British calendar was reorganised (New Year's Day became 1 January) in 1751: Britain would adopt the Gregorian calendar 1 year later. The Jew Act 1753: allowed Jews to become naturalised by application to Parliament. The Marriage Act 1753: enumerated the minimum age of consent for marriage. 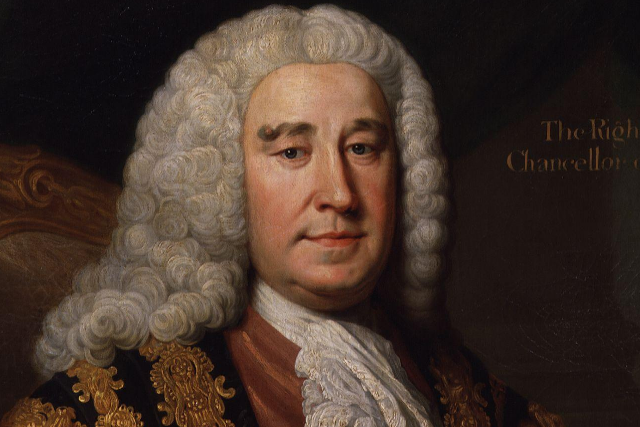 The Earl of Chesterfield on Pelham: "He was a very inelegant speaker in Parliament, but spoke with a certain candour and openness that made him well heard and generally believed."